The robots are coming to school: Now what? In schools and districts, open source software is gaining momentum as it fuels innovation in education and allows flexibility to the institutions that adopt it. Rather than being limited by the features offered in a proprietary solution licensed from a traditional vendor, a truly open source offering allows the user to freely access and modify the source code to create the system they really need; a solution that works well with other ed-tech solutions in the existing ecosystem. While open source software is free of licensing fees, there are associated costs including the technical expertise to implement and configure it, as well as deploy and support it. For many agencies, having this level of control along with the ability to change and add to their digital infrastructure as needed brings a huge benefit, especially when they tap the services offered by the developers of the open source system. Open solution: Traditionally, when a school district adopts proprietary software for its core infrastructure, it can easily become locked into one solution or vendor, which greatly reduces choice and flexibility. Since educational policies, goals, and strategies change from time to time, a flexible, open infrastructure can better enable you to offer effective solutions and maintain control of your ecosystem without getting walled in. Lower cost of ownership: Every district has a unique combination of students, styles of teaching, and operating models. Proprietary software is usually packaged to fit a generalized need, which naturally leads to a high acquisition cost. With open source software, there is no licensing cost and decision makers can pick and choose the exact components or features they need and package them into their system of choice, therefore providing a much lower total cost of ownership. Interoperability: Open source software applications and modules that are compliant with open standards like the ones from IMS Global can be combined to work seamlessly together. This plug-and-play approach brings great flexibility to the user, allowing a best-in-class approach where software from different vendors can be combined into one unified and fully tailored ecosystem. In the long run, open source software in combination with open standards may prove to have more longevity than the proprietary systems that come and go. Thanks to the solid reliability of commercial entities and, of course, the innovative communities behind them, open source software will increasingly stay in the mind of ed-tech leaders to meet the ongoing needs of educational progress. 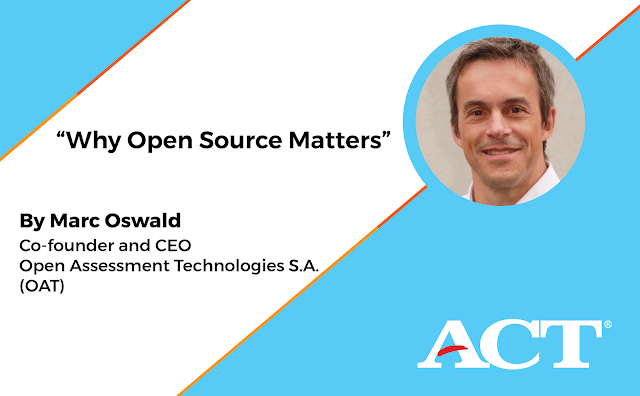 ACT, which is transforming into a measurement, learning and navigation organization, recently invested in Open Assessment Technologies S.A. (OAT) as a powerful endorsement of open solutions that benefit learning and measurement for everyone from school through career. OAT is the award-winning provider of open source assessment solutions and best known for its QTI®-native assessment platform, TAO®. Learn more.